Auricular therapy is a therapeutic intervention in which needle stimulation of the external ear is used to alleviate discomforts of the body/mind/spirit. 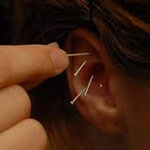 While it is based upon the ancient Chinese practice of acupuncture, it was first developed in modern France. The protocol of five different points in each ear has been shown to balance the body’s energy and assist the body’s healing processes. Together treating these points can help restore calm. They can produce relaxing and centering effects while nourishing, restoring, and supporting the body’s overall system. Withdrawal symptoms from addictions to smoking, alcohol, and other chemical substances by reducing cravings and supporting increased sense of well-being. Group acupuncture is an affordable way to make the gifts of Chinese Medicine accessible to the community at large. Once participants have registered with the acupuncturist and received their brief orientation, they will be able to use this treatment on a drop-in basis. There will be a fee for each treatment, which usually takes about 30 minutes. The group treatment space will be a place of quiet, rest, and contemplation. Participants will be seated and clothed. We ask that you enter prepared to honor the space for the healing it has to offer you and the others present.